After Vionic helped Petsy make sales on Facebook, the pet supplies e-tailer once again turned to Vionic to help engage customers and generate new leads online. Petsy was looking for an engaging way to attract customers, collect qualified leads and increase brand awareness on Facebook. Create a customized Photo Contest campaign on Facebook using Vionic’s Deal Maker Pro. How Did Petsy Do It? Founded in 2013, Petsy is Mexico’s premier online retailers of pet products and supplies. Simply put, they aim to make pet owner’s lives a little simpler, one delivery at a time. Petsy strives to offer your pets a variety of quality products and excellent delivery services straight to your home. Petsy was looking for fun way to generate qualified leads and build brand awareness on Facebook around the Halloween holiday. Petsy set a budget of $50 and promoted the contest through their website, social media networks, and popular magazine publication, Selecciones, to drive participation. After 34 days, Petsy brought heavy traffic to their Facebook photo contest, accumulating 2,799 votes and 48 Photo Entries! 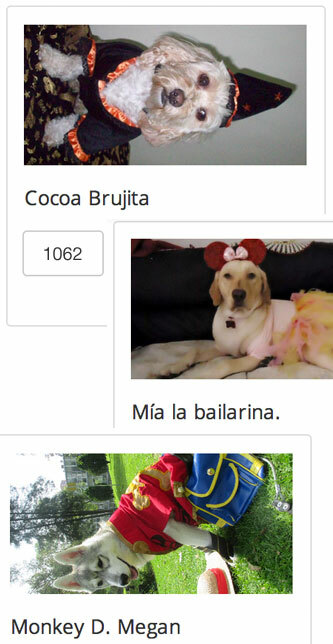 The winning photo featuring “Cocoa Brujita” from Leslie received 1062 votes, followed by “Mia la bailarina” from Paola with 852 votes and “Monkey D. Megan” from Gustavo with 105 votes! As a result of their promotion, Petsy was able to generate 48 high quality leads, including 66% new leads, using Vionic’s Deal Maker Pro! Petsy also offered discounts to all contest entrants as a follow-up to their successful campaign.